St. Paul's Anglican Church in Trinity is the third Anglican church in the community since 1730. It is built on the site of the first church, which was erected in 1730, and is adjacent to the second structure, which was constructed in 1820. The bell in the third church was donated by a local merchant Robert Slade in 1833 and was initially installed in the second Trinity church. St. Paul's Anglican Church is an excellent example of the Gothic Revival style. Plans for the third church were prepared by Stephen C. Earle of Worchester, Massachusetts. It is believed that St. Paul's was built by either Caleb Marshall or James Harvey of St. John's. 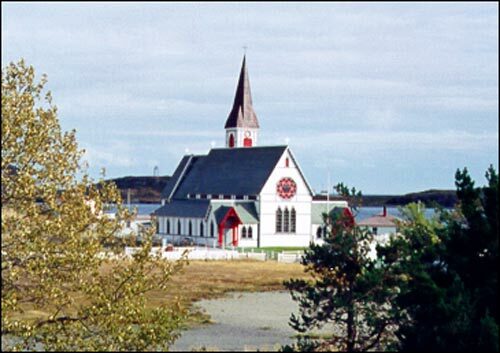 The wooden church with its arched windows, chancel, side aisles and tower with a spire is an excellent example of Gothic Revival architecture in outport Newfoundland during the nineteenth century. The neo-Gothic structure has the same design as churches at Digby and Winsor, Nova Scotia. Construction began on March 20, 1892, and was completed on November 13, 1894, when Bishop Llewelyn Jones held the consecration service. Notable Anglican ministers have served in Trinity since its inception in the mid-sixteenth century. The first regular rector, the Rev. Robert Killpatrick was sent as a missionary by the Society for the Propagation of the Gospel in 1729. The first Anglican bishop of Newfoundland appointed in 1839, the Rev. Aubrey Spencer, served in Trinity from 1820-1821. He was replaced by the Rev. William Bullock in 1822, who remained as the community's minister until 1841. During his stay he wrote the hymn, "We Love Thee Place", which was first sung in Trinity in 1827 and is currently listed as hymn number 466 in the Anglican Book of Common Praise. The interior of St. Paul's is impressive as it was never painted and the original wood work is still in full view. Over the years the congregation has attempted to conceal the modernization which had to be made to the original structure. The duct work for the oil furnace, which replaced the initial two wood stoves, is concealed. Similarly three ceiling fans and a public address system were installed in such a way as to make them hardly noticeable. The most noticeable change was the transformation from oil to electric lighting. The altar was a gift to the church from six Anglican clergy who were born in the community. Behind the donated altar is a stained-glass window depicting the crucifixion of Christ illuminated by the rising sun. Another interesting feature is the baptismal font which is said to be a replica of the font at the famous Notre Dame Cathedral in Paris, France. Above the baptismal font, the setting sun illuminates a stained-glass window of Christs transfiguration. On June 8, 1987, the Heritage Foundation of Newfoundland and Labrador designated St. Paul's Anglican Church a Registered Heritage Structure. The church was presented with a commemorative plaque by the Heritage Foundation of Newfoundland and Labrador in July 1998. Also view St. Paul's Anglican Church Registered Heritage Structure on the Heritage Foundation of Newfoundland and Labrador web site. The Newfoundland and Labrador Heritage Web Site has on its site only a portion of the registered heritage structures in Newfoundland and Labrador. To view a complete list or search for a particular structure visit the Heritage Foundation's Property Search page.